Fame Deals: The Baphomet 5 NTB with neck-thu-body construction for unbelievable 779€ reduced from 899 €! The arched body ensures for better playability and comfort, while the neck-thru construction delivers endless sustain and an extra portion of Punch. Similarly to its brothers, the Baphomet 5 NTB presents itself as nothing less than a premium grade bass with an exception price to performance ratio. Equipped with a neck-thru design, constructed from 5 strips of mahogany and sycamore maple, the Fame Baphomet 5 NTB delivers endless sustain and characteristic Punch. The flat profile of the neck lies comfortably in your hand and forms the ideal foundation for fat grooves. 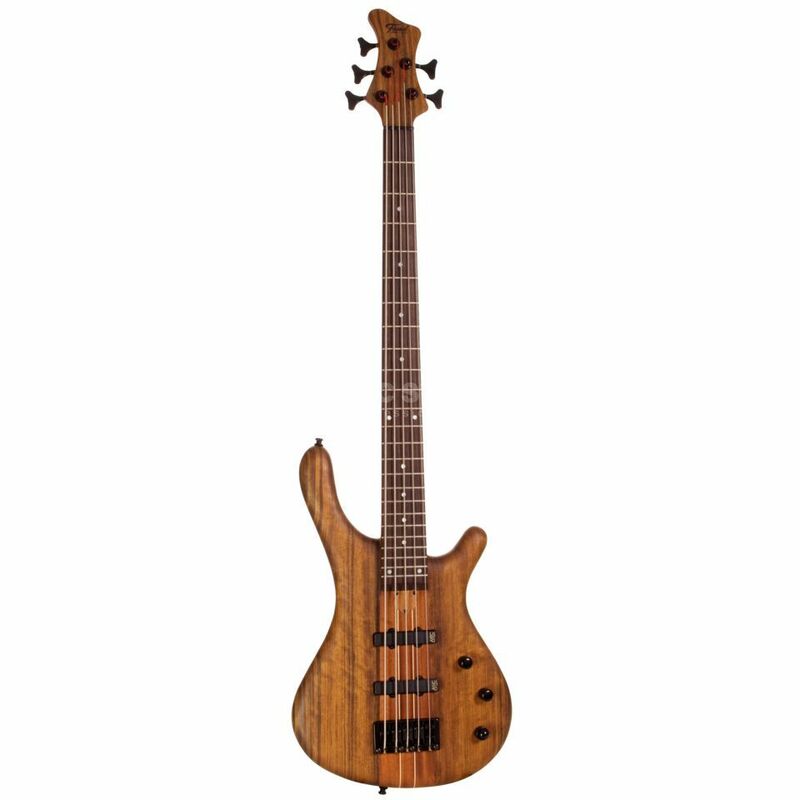 In addition, the arched body shape – unique in this price class – offers a high level of comfort, whereby the bass forms to your body, ensuring for optimal playability. Active MEC Jazz single-coils ensure for a powerful and variable sound, while the solid bridge improves sustain a response. Active Jazz single-coil pickups from the German manufacturer MEC capture the fantastic sound and the endless sustain of the Baphomet 5 with harmonic transparency, whereby each string is balanced. The 2-band sound control, also from MEC, gives this thoroughbred exceptional versatility. Regardless if saturated low-end boost, aggressive and growling mids or brilliants solo sounds, these electronics deliver a truly musical experience even in extreme settings. The solid WSC Partsland SI5 bridge contributes to the great sound and epic sustain of the Baphomet, while the ball ends can be dropped in, considerably simplifying string changes. Robust WSC Partsland JB15 tuners guarantees tuning stability and do not cause top-heaviness due to their low weight. The Fame Baphomet 5 also comes equipped with a pair of Schaller Security Locks, to make sure that your precious instrument stays securely suspended from your shoulders. The electric basses of the Fame Baphomet series are absolutely top-of-the-line, professional instruments. They convince with luxury appointments and the use of premium quality materials. These internationally renowned bolides are handcrafted by experienced master builders in the M-Guitars foundry in Danzig, the same workshop responsible for Mayonnes basses. Music Store in Cologne receives these instruments directly from the manufacturer, cutting out the middle-man, allowing us to offer these wonderful instruments at incredibly low prices! My first reaction when picking up Fame (thats how I called my bass) was to curse at how heavy it felt, but once it sits on your shoulders, you barely feel it as the weight is very well distributed. The craftsmanship of this bass is great and it even smells good (seriously, give it a whiff). The body and neck have a nice resonation, it is easy to calibrate the intonation, truss rod, action and pickup height. However tuning is not so easy, but just because the tuning mechanics are really sensitive. I do advise you to raise the Low B strings action close to maximum as it tends to fret a lot. After having set the bass up, it was time to plug it in and try it out. I put all the knobs in the middle position and turned up the volume. I cringed right away. Do not get me wrong, it sounds great, but it felt a little bland, but just a quick turn of the knobs and BOOM it started roaring. The MEC pickups have a wonderful sound but do not expect humbucker-level bass without an EQ. On the other hand, the treble shines in this bass. It would have felt nicer to be able to balance the pickups independently but the single balance button is still enough to push out the desired sound. For a double single-coiled bass, it works really great for rock, metal and any style requiring bassy oomphness (just remember to put the treble lower). For Jazz, Blues and mid level playing, it gives you a clear and bright sound but it requires some tweaking to make it work just right for slapping. For a single-coiled 5 string, the Low B sounds good but should be EQd with a pedal to give it more presence since the lack of bass makes it feel a bit too bland. Take the bass problem out and you pretty much get a Warwick bass for half the price. You get a high quality bass with high quality sound without the high quality "brand tax".